We love celebrating the 4th of July. It always brings to mind fun times spent with family and the sound of fireworks. This is the first year that the kids understand the concept of Fireworks. On our recent trip to Disneyland, they saw fireworks and loved to say, “boom!” as they burst in the sky. I decided that it was the perfect year to start doing 4th of July crafts. They had already done painting in a zip lock bag when they were much smaller and loved it. So, I decided to re-introduce that technique into making fireworks. We had plenty of shredded paper in our shredder, perfect for making fireworks. 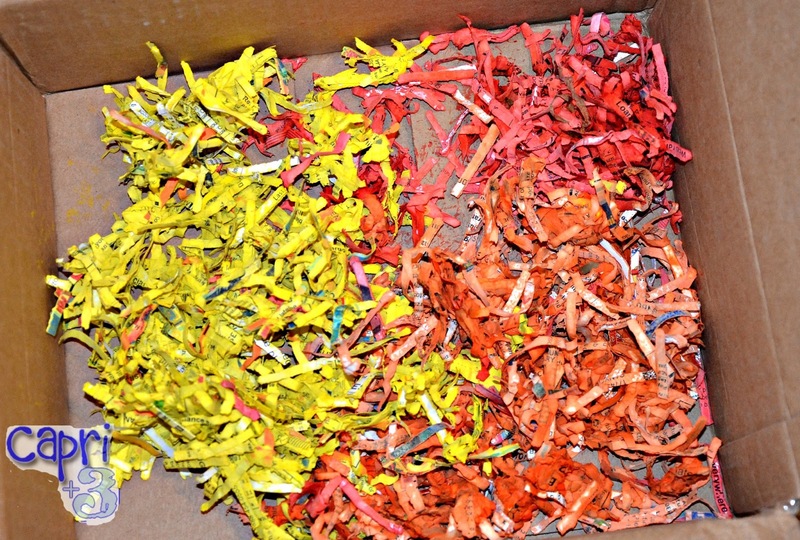 Put the desired amount of shredded paper into the bags (one for each color). 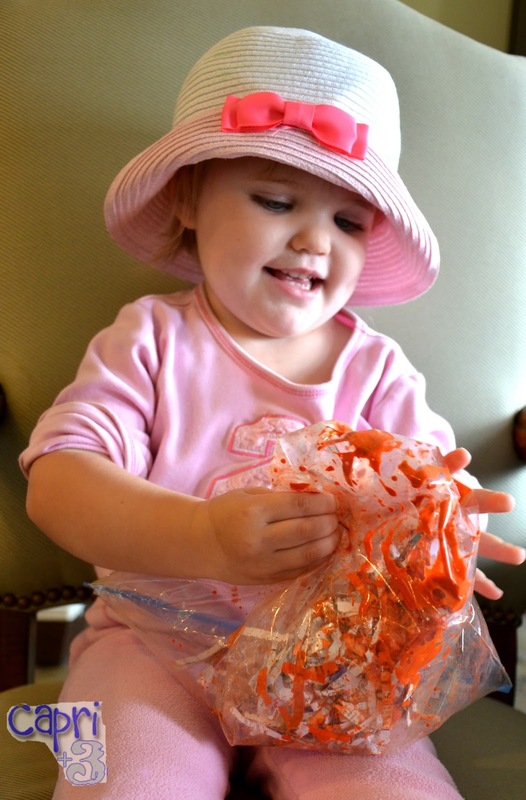 Squeeze tempera paint into each bag and zip them shut. 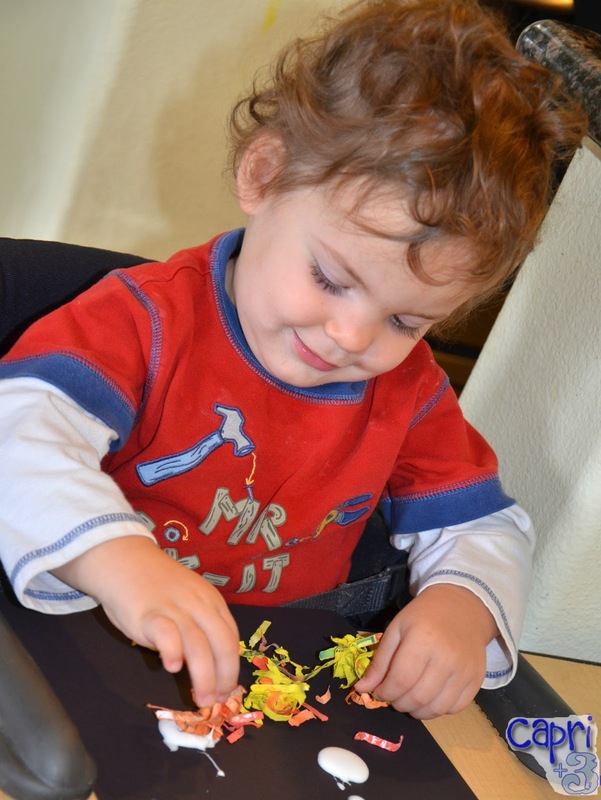 Have your children squeeze the paper and move it around until it achieves the desired color. This is a great sensory experience and they can do this part of the craft in any attire because there is no mess! You can see my original post on painting in a bag here. Then, empty the bags of colored paper into a cardboard box to dry. Capri had fun squeezing the bag to color the shredder paper orange. I placed all three colors of shredded paper into one recycled box to dry. 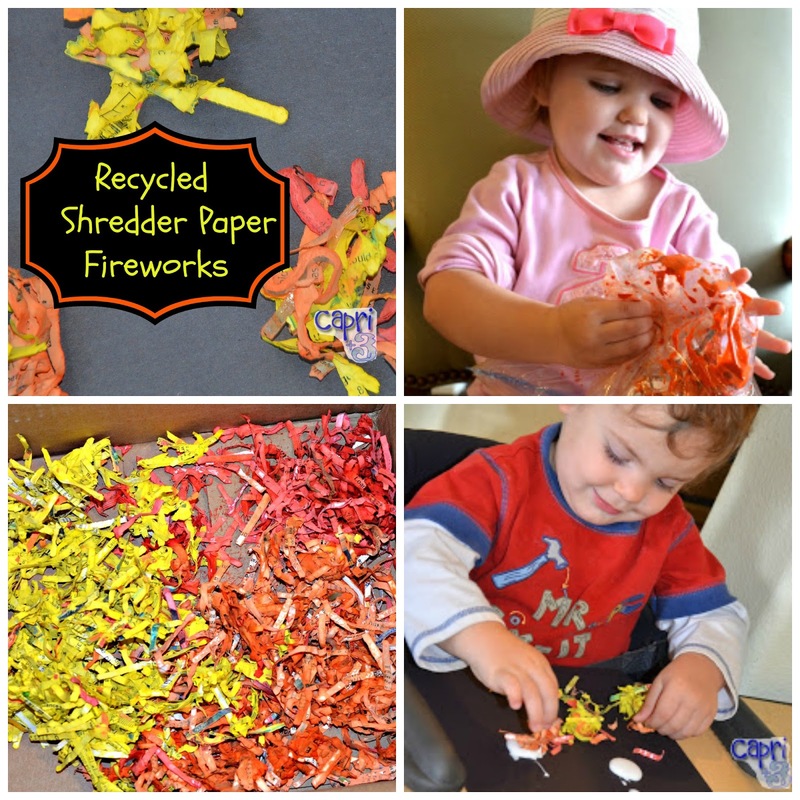 Once the shredded paper is dry, add glue (or help your child to do this) onto the black paper wherever the fireworks will go. Then, your child can pick the paper out of the box (mix it up if desired) and create fireworks by pressing the paper onto the glue. Once the fireworks are dry, tilt the paper over the box to allow any shreds that did not stick to fall off. Then, you can display the fireworks craft on the 4th of July. Xayden liked pressing the paper onto the glue. I hope you enjoy making this craft with the children in your life. Have a happy 4th of July. 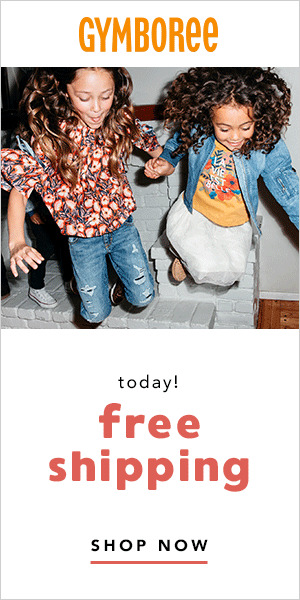 What will you be doing to celebrate? I would love to read about your plans in the comments. I love this. So interactive and colourful. Happy 4th of July to you… we had Canada Day yesterday. Thank you. Happy Belated Canada Day to you. I hope you had fun. Enjoy the rest of your week. This is a great craft. It corresponds to 4th of July, uses recycled materials and promotes fine motor skills…… Not to mention, it looks like a lot of fun. Awesome! They had a great time making the fireworks and it was nice that it could be done in two parts for two separate craft experiences. Thank you so much for sharing this fun project at All Things Pretty! I could just come here every day and look at those precious babies. Mine are 19 months apart so I have a TINY taste of multiples so my hat is off to you but what a joy they must be too! Thank you! I appreciate that you hosted All Things Pretty. 19 months apart is very close in age and you can relate to our experience. They are a lot of fun and it's nice to have a built in play group.